The Next Generation team did themselves proud yet again with another highly entertaining and professional feature film, which I wholeheartedly enjoy. However, it does remain less memorable than most of the others simply due to the fact that it is by far the least original, as most of its best portions are easily traced back to previous films or episodes. The heavy plundering of Star Trek II: The Wrath of Khan is the most obvious, from angling the main conflict to be a battle between the Enterprise and another ship, to trying to outdo Khan with a huge villain deeply connected to our hero, to the all-too-careful set-up of another temporary "we didn't really mean it" sci-fi death for one of our regulars. Of these, the space battle is the most welcome, since this is an element that had perhaps not been focused on too much since Star Trek II, and this film came up with a much-talked-about new twist on it. But the moviemakers' need to have the big space battle with the big "villain" seems to have limited the avenues in which the film's really original ideas might have gone. Picard's clone would probably have been more interesting if featured over a number of TV episodes while exploring a variety of issues and triumphing over some of them positively. It was really great to finally see the Romulans take their rightful place in the features, and to explore not only their culture, but that of the Remans, whose planet had been mentioned a few times but largely ignored. All good stuff, which again could have been really interesting if not formulaically plodding down the most predictable path possible. My biggest beef with what we do get in this film all surrounds the believability of B4's participation in the main plot, which stretches credulity at every turn. Firstly, his existence grates terribly against the supposed rarity of Soong androids. Secondly, it's very far-fetched to think that Shinzon would come across one before anyone else - his only real opportunity would have been during one of his campaigns in the Dominion wars when he had access to Federation space, and surely he would be occupied by other concerns at such a time. Thirdly, the idea that the Enterprise could detect the pieces from several star systems away, without actually having any interest in looking for them, is another stretch. But worst of all, the villain's whole plan seem to hinge on the idea that the Enterprise crew would not only discover this android but also divert themselves to pick it up, put it together, and let it loose on their ship, all on a schedule that fits seamlessly with the rest of Shinzon's plans. This is just taking it way too far for me. How can he credibly depend on such a complicated and almost random sequence of events being carried out by people he has no real influence over, while keeping his desire for that sequence of events a secret from them? It's bad enough when "deus-ex-machina" pops up in a screenplay to get the protagonists out of trouble, but when the villain's plan needs "deus-ex-machina" in order to work, it doesn't actually work at all. Any slight random variation in the protagonists' actions, which is HIGHLY likely in this case, will render the whole plan useless. Only in fiction can it all work out so nicely. And of course, the whole real reason for using B4 as the villain's tool in this film is to allow Data to give us a re-run of Spock's temporary death. REALLY not worth it. If you're not going to be serious about Data's death, don't bother going through the motions. The concept of Data encountering brotherly (or even daughterly) Soong androids had also been covered fairly extensively and fairly well over the course of many episodes of the Next Generation series, and it really doesn't feel like any important new ground is covered here in this film. There's another important nail in B4's coffin that probably few viewers will have noticed. In order for the Enterprise to find B4, Shinzon apparently places him on a planet with a pre-warp civilization (who like their dune-buggies). The Prime Directive should prevent the Enterprise crew from going down to the planet. They completely disregard this consideration without making any mention of it. Perhaps they think the Directive doesn't count because they are only wandering around in the desert collecting artefacts, and maybe they'll just as soon do that as spy on other cultures with duck blinds. But how can they assume that the positronic signature isn't either indigenous to the planet's culture, or part of a symbiotic cultural system as was the case in the animated episode "Bem"? Or perhaps the Prime Directive has been thrown out in the years between the end of Deep Space Nine and this solitary adventure at the farthest end of Star Trek's future that we've seen so far on screen? Anyway you slice it, the immediate descent into a shootout in dune-buggies is far less than an ideal first-contact performance for Picard and company, grating against the boasts he made during his opening Best-man speech at the wedding. I think the timing of Shinzon's illness is also unbelievably convenient, leaving him looking normal for all the years leading up to the opening of the film, and then taking him down to an obvious near-death look during the few days over which the film takes place. To give credit where credit is due, I think the energy of the film takes over and helps mask the holes of character logic in the plot. Stuart Baird's extensive editing experience has led him to become an outstanding director, as evidenced here, and indeed this film seems to have more polished picture and sound editing than its predecessor. However, the pace seems to depend on editing a little too much for my tastes, and I think Jonathan Frakes has a better instinct for composing action shots that stand on their own. The more any one shot can excitingly tell you what's going on, the longer you can hold it, and the longer a span of attention you can command, which is a noble aim. Food for thought. 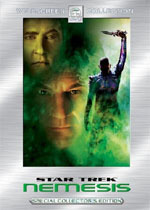 I think we should also note that this film delivers something that "The Wrath of Khan" only teased us with, and that is good face-to-face confrontation between hero and villain. Tom Hardy really does excellent, energetic work with a role that automatically carries high expectations and increased scrutiny and he does it so well, especially opposite Patrick Stewart. The two have a lot of great scenes together which spark with high voltage and depth, and are very satisfying from a dramatic point of view. Philosophically, a lot of obvious potential goes unrealized, however. The concluding dynamics work well for a standalone film, but let's not pretend we haven't seen it before, as the elements greatly resemble those of Star Treks 7, 9, and 2. One still can't deny the satisfaction of this higher energy level though, or the use of a formula that pretty much always works. With this film, music composer Jerry Goldsmith has hit his third home run in a row. Excellent new bits include some nicely bizarre synthetic percussion for the discovery of the new android, plus some cool rousing Romulan music. It's strange that the big screen Klingon theme had been with us since 1979, while it took another 23 years to get to the Romulan equivalent. Far too long, meaning that in the long run, Fred Steiner's theme from the original series may remain more definitive in spite of its being shared with mirror universe empires and any villain of the week that needed a reliable stock music track. Sadly, "Nemesis" just doesn't have the kind of content that would inspire the more beautiful types of Jerry Goldsmith melodies that both "First Contact" and "Insurrection" became famous for. Here, the closest approximations come from heartfelt repeats of well-established Star Trek anthems and the four-note Sybok motif. It's a great, enjoyable, moving score in the end, but still necessarily eclipsed by the music of the previous two films due to the very nature of what it had to be to make this movie work. Don't get me wrong; I like this film. It's a great ride with my favourite Star Trek cast. But of the four Next Generation films, it ranks third behind the previous two Jonathan Frakes films, with all of these top three films being quite far ahead of the disastrously misconceived "Generations". Read the next Star Trek review: "Deep Space Nine: Emissary"
Star Trek 10 is available in various incarnations on DVD and Blu-Ray. Audio commentary by director Stuart Baird. Audio commentary by producer Rick Berman. 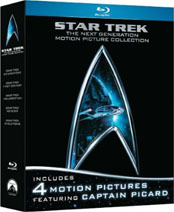 Or, get all 4 Next Generation feature films on Blu-ray at once with an exclusive bonus disc. "The Evolution of the Enterprise"